4 root top units ready to go! We offer quality commercial HVAC installation solutions for replacement heating and cooling systems for your business. Whether you need a new air handler, roof top unit, furnace, condensing unit or entire HVAC system and ductwork, we have extensive experience in the installation of commercial HVAC systems. 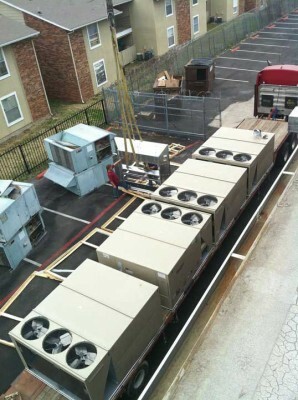 We have been serving the Dallas-Fort Worth area’s commercial HVAC needs for over 20 years. You need to run your operation, not go to tech school just to understand what you are buying. This is another facet of our business-to-business relationship: we deal straight and deal in straight talk. All of the major brands have engineered vastly more efficient commercial AC units. They recognize that energy costs keep rising, but that real savings are possible with leading edge technology. We’ll help you choose products with the ENERGY STAR® credential. Whether you are replacing an inefficient unit, or installing an air conditioning unit for the first time in new construction, you have the best energy saving options in history. We are focused on first quality installation and air conditioning maintenance. With so much evolving technology, we make certain our certified technicians receive ongoing continuing education in new engineering, installation techniques and service innovations. 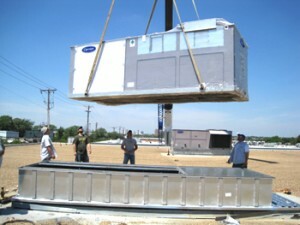 It is an investment in the best customer service we can provide to customers purchasing one of our commercial AC units. Allow us to bid on your next commercial air conditioning installation project. Contact us online or call 817-459-4100 or 972-233-1637 to request a free proposal for your next project. While our air conditioning company is based in Arlington, our service area includes the entire Dallas-Fort Worth Metro area including Dallas, Fort Worth, Colleyville, Pantego, Mansfield, Keller, Hurst / Euless / Bedford, Southlake, Grapevine, Lewisville, and other surrounding communities.